Professional golfers along with their sporting compatriots who wield a tennis racket for their living, inhabit one of the most sought after professions in the world. Well, certainly as far as the enthusiastic amateurs who seek to emulate their exploits of a Sunday morning are concerned. Not only do they get to play the sport they love seven days a week, but they do it in some of the most exotic locations all over the world. Not for them a rainy day at the local municipal. However, as the growth in the popularity of the sport has accelerated rapidly during the course of the past 50 years, fuelled in part by the attentions of the television companies, so the opportunities for mere mortals to tee off in unfamiliar and, dare we say it, more alluring settings, have become available, too. And at prices that are relatively affordable.Travel companies and specialist agents are never slow to realise a potential market when they see it, and the legions of casual golfers are just such a lucrative source of income. Not only are established European destinations such as the Iberian Peninsula and Southern Ireland within reach, but even some of the places of worship nearer to home that make up the list of venues for the Open Championship on the itinerary of brochures and travel sites on the internet. On top of this “more traditional” choice, there are destinations around the globe where the only invitations you need to have a good time are a passport and a set of clubs. So while your stick in the mud mates are still booking their package to Portugal for the 10th time in as many years, you can leave them open mouthed by dropping the fact that you’re off to Peru this year, or maybe Argentina. Then again, Singapore quite takes your fancy. South Africa doesn’t look too bad either, and then there is the attraction of seeing if some of Greg Norman’s charisma will rub off by heading off to Australia for a few rounds. Suddenly the bravado your friends had been displaying will have quickly drained away. Of course, the old lags in the clubhouse may chuckle into their glasses of Scotch at the thought of paying good money to travel thousands of miles. 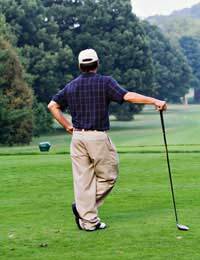 Especially those who cling to the idea that nowhere possesses a finer 18 holes than their own beloved course. What one might term a bunker mentality. But the majority of golfers thirst for new challenges, especially those thrown up by fairways and greens that are the product of the fertile imaginations of a new generation of course designers responding to the demands of the sport’s emerging nations.It may be that experience of playing golf in another country only serves to reinforce the attractions of your own club. Maybe the old lags were right after all? But the chances are that once you’ve taken your clubs through Customs once, you’ll be on the phone booking your next international tour date before you’ve had a chance to unpack from the last trip. After all, there’s no reason why Padraig Harrington and Tiger Woods should have all the fun!